For guidance on the above topics, see F5’s knowledge base. Note: You must configure your F5 load balancer before installing PAS. 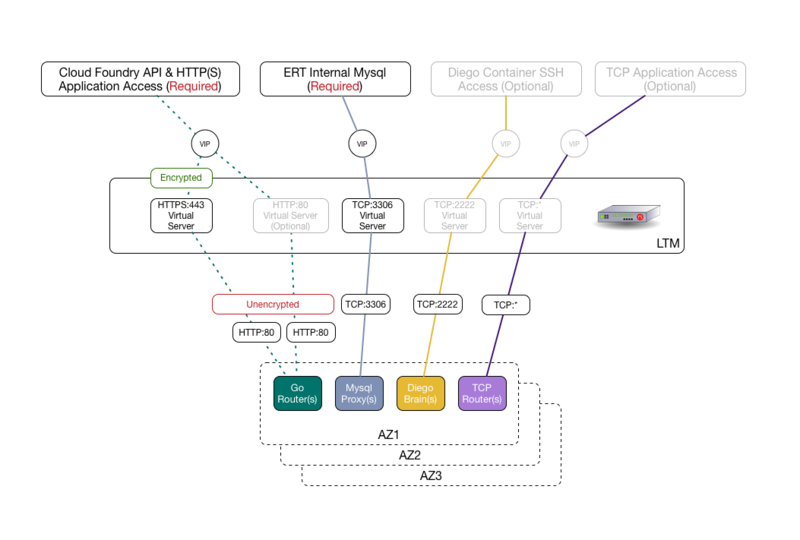 To use your F5 deployment as a load balancer, you must configure it to forward unencrypted HTTP following the steps below. This procedure assumes that you are running F5 v12.1.2 or v13.0.0. This PAS configuration option forwards unencrypted traffic to the PAS Gorouter. It assumes an external load balancer is configured to forward unencrypted traffic. This configuration terminates client SSL at the F5 and forward standard HTTP traffic to the backend Gorouters from the LTM. All TCP backends accept forwarded traffic from the LTM. In the F5 UI, go to Local Traffic. Go to iRules and click iRule List. Go to System, then File Management, and click SSL Certificate List. Import your PAS certificate and name it pcf-pas-cert. Import your PAS certificate key and name it pcf-pas-key. Go to Local Traffic and click Monitors. Go to Local Traffic, then Nodes, and click Node List. Go to Local Traffic and click Pools. Create an SSL client profile. Go to Local Traffic, then Profiles, then SSL, and click Client. Add a certificate key chain. Note: Your deployment may require additional root or intermediate certificates. You can select them here. Additionally, you can also enter passphrases for certificates. Create five LTM virtual servers. Two are required, while three are optional. Go to Local Traffic, click Virtual Servers, and click Virtual Server List. Note: This VIP must be DNS-resolvable to your PCF system and default apps domains. Note: This must be set in one-arm configurations. Note: This VIP must be DNS-resolvable to the fully qualified domain name (FQDN) entered into your PAS configuration for MySQL Service Hostname. Note: This VIP must be DNS-resolvable to ssh.[YOUR-PCF-PAS-SYSTEM-DOMAIN]. Note: This VIP must be DNS-resolvable to tcp.[YOUR-CONFIGURED-TCP-DOMAIN]. Once you have completed configuration, check the Network Map located in Local Traffic Menu. Everything should be green. Single configuration files (SCFs) are single files containing a complete F5 configuration for F5 v11.x and v12.x. This section contains sample SCF files for functional reference configurations. Often, presenting a reference SCF “template” to an F5 administrator can provide all necessary configuration information for configuring PCF F5. For more information, see Overview of Single Configuration Files (11.x - 13.x). You can see a sample SCF here. See Pivotal Services Legacy iRule Bank Git Repo.